(MP068). Ossie Jones (1947 -). watercolour vignettes. Standard size print: 17 x 12ins (43 x 30.5cms) approx. 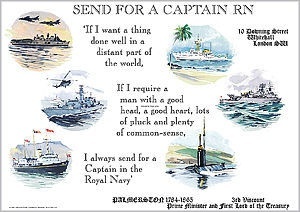 "If I want a thing done well in a distant part of the world; if I require a man with a good head, a good heart, lots of pluck and plenty of common-sense - I always send for a Captain in the Royal Navy".